Arnold Lobel. Adventures of Frog and Toad. New York: Sandy Creek, 2010. 198 pages. This book is frickin awesome. There. I said it. Now I can tell you precisely how and why I like it so incredibly much. Toad (1979). You can get the gist of the whole series from the first title. Frog and Toad are friends. They spend all three books hanging out together in the meadow, visiting each others’ houses, and talking about their relationship. It’s actually much cooler than I just made it sound. I’ll break down why. First, the sentences are short, most of the words are simple, and the type is big. Even if your little one isn’t reading independently yet, she can follow along with you and pick out a few sight words, at the very least. It’s ideal for your little one who’s just learning to read. Each book has five stories of about 12-14 pages, and the action moves along, so your little one should stay interested. Second, the friendship between Frog and Toad is lovely. They both have their issues they’re working with (especially Toad), but they really enjoy each others’ company. Mostly, Frog’s encouraging Toad to do something (in the first story, it’s to get out of bed), but Toad has his moments, too. It’s very nice to see them getting along through all three books. Third–and this is the clincher for me–the illustrations are incredible. They’re very 70s looking, in a good way. My favorite thing is that both Frog and Toad wear pants, a belt, and a sport coat. They would be incredibly overdressed just to hang around the house today, but it gives you a sense of a time when people dressed better. Every page has an illustration, and they really help to tell the story. You wouldn’t think you could show a big range of emotions on amphibians, but Lobel shows them happy, content, angry, and fearful. The stories themselves are pretty simple. “The Letter,” for example, involves Toad moping about how he’s never gotten a letter from anyone. Frog goes home and writes him a letter, gives it to a snail to deliver, and comes back to wait with Toad until it gets there. Pretty basic stuff, with most of the conflict internally-driven. I think that’s what I find most interesting about the book, since it shows a clearly adult frog and toad going about their daily lives and encountering adult problems, but in a way that’s relatable to kids. It might give your kids a hint that even when you’re the person who cooks the food, does the dishes, and finds lost objects, you’ve got some problems of your own. In short, this was an excellent book with tons of re-reading value. Each of the books within the book is perfect for a twenty-minute bedtime reading session, and you can have some fun asking questions and talking about what’s going on in the pictures. 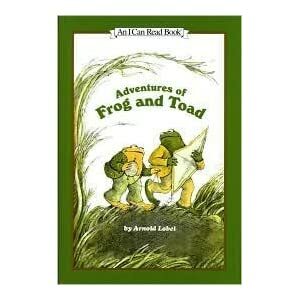 This entry was posted in book reviews, reviews and tagged Adventures of Frog and Toad, Arnold Lobel, book review. Bookmark the permalink. Yes. Yes. Yes. My friend and I (who are epitomized by Frog and Toad) to this day quote these books. I believe that you don’t necessarily have to be Dostoyevsky to write great literature; maybe I’m a kid at heart but many of my favorite books are “I Can Read!” and Golden Books. 🙂 Poky Little Puppy FTW.